See if a Life Coach / Mentor is right for you! Don Blanton does not believe in soft peddling the truth! He will not dance around the issues with you. He is experienced, successful, kind, caring, and will guide you through the obstacles and roadblocks that may stand in your way of happiness, success, career, school, self worth, work related issues, or finding out who you are and what you want to do in life! You also may be at the point in your life where you want to make a change in your present situation or career and you don't know where to begin. Don will give you the tools and insight necessary for you to become whatever or whoever you want to be, or to find out what changes will give you more happiness or fulfillment in life. But, he can't do it for you! The success of the coaching process is always up to you! A life coach is similar to a sports coach. Any coach can only inspire the athlete to do well and to give them the tools and the training necessary for success. Coaching only works if you are ready to make a change and to make a commitment to yourself. What you put into action will determine how much success you will have in making those changes. 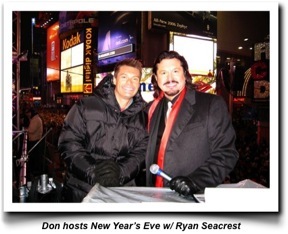 Don has been in show business all of his life and owns many successful businesses. You can learn from his life experiences! To get a sense of where you are in your life, ask yourself Don's 50 Power Questions! 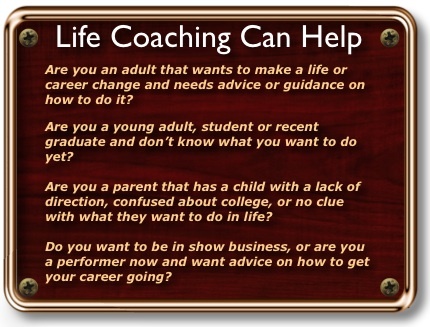 If you feel that you are ready to make some life changes and want to find out if coaching is for you, then sign up below for a FREE 30 minute consultation and life coach session with Don. Don is easy to talk to and you will have more insight into what coaching can do for you. There is nothing to buy and no obligation to continue. Click here for a FREE Phone consultation and 30 min Life Coaching Session! Do you need help trying to find your way in life? Have you ever found yourself with any of these thoughts? I am confused, there are too many choices in life. Which one should I go for? They all say I should do it this way, or to be like everyone else, what if that isn't me? My parents want me to go to college...I don't really want to go yet... is there an alternative? They say you need contacts....but, I don't know anyone...how can I make contacts? I need help...if someone only believed in me! A Life Coach with Don's experience can help you work through any of these topics and can assist you in making decisions or trying new things in your life! Fear can hold all of us back from doing the things we really want to do but thought we could not do them! Yes, you can overcome the fear to try the things you always wanted to do. If you feel that you are ready to make some life changes and want to find out if coaching is for you, then sign up below for a FREE 30 minute consultation and life coach session with Don!